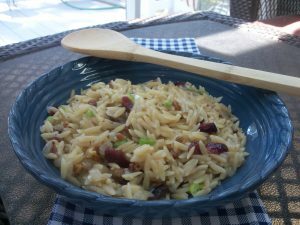 Next time you prepare orzo, take it in a new direction with thyme, cranberries, pecans, and green onions. Thyme is not my favorite herb, so I reduce the amount I add, and I enjoy this dish. This is a quick and simple dish great for busy weeknights, or a dish you could serve to guests that will impress. Enjoy! In a medium saucepan, melt butter over medium heat. Add onion, thyme, and salt; cook, stirring frequently, until onion is softened, about 3 minutes. Stir in orzo and cranberries; cook for 2 minutes. Stir in broth, and bring to a boil. Reduce heat tot low, cover, and cook until orzo is tender and liquid is absorbed, about 15 minutes. Gently stir in pecans and green onion. Serve immediately.